The Rhino Filters provide a total cleaning of unwanted odors! Total purification of unwanted odors is dependent on a number of factors. The first and most important is the choice for high-quality carbon. The carbon filters where Rhino has chosen the high quality RC -412 carbon, which occurs only in Western Australia. 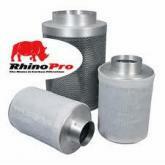 Due to the small granulemaat of the coal used in the Rhino Filter the carbon bed has no empty spaces. Due to the large pore size the cabbage has an extra large surface area in which ( organic ) odor is absorbed. This is sufficient a short contact time to rid air complete and sustained organic odors.